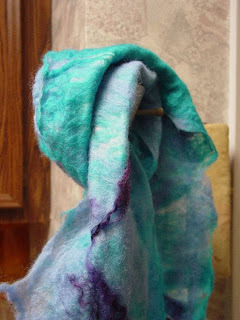 Froggy's Fiber Followings: Look Ma, I'm felting! Over the last week I convinced myself that I wanted to learn how to nuno felt. Yes, I said NUNO FELT! So I'm not great at needlefelting, relatively slow knitter, havent really crocheted anything in a couple of years..... so yeah, time to pick another fiber outlet. I would try weaving but I cant afford the equipment yet and as my husband with attest, I like my pretty fiber tools. 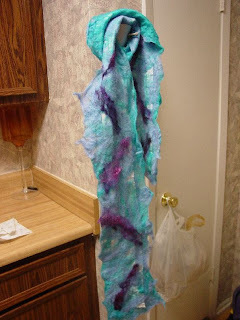 (Still eyeing the Sonata.... soon my pretty, soon....) So, I bought what I could discern to be the supply list for nuno felting and tried my hand at it. So, first mistake I bought muslin. I thought that the muslin was supposed to be just as good as silk chiffon. WRONG! But muslin was the quickest, easiest and cheapest thing that I could buy on an impulse. 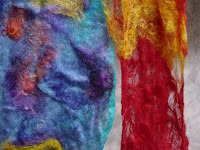 and through and crinkle the fabric.... but not muslin. At least not this type. So here is my first creation. I like it.... except for the muslin. See there is a line of muslin that goes straight down the scarf. So that was my mistake. Lesson learned. I learned not to use muslin. 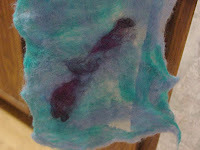 But I still liked the process of felting so I proceeded to work on two more tonight. I just took a little sample photo of them, their hanging up to dry right now. The red and yellow is really see through. The other one is going to be called Melted Crayon Clouds. It has a two toned blue base and lots of spots of color on the front. I really like these two so I will have more pics once they dry.